Olson Technology, Inc. Ethernet/FTTH fiber optic transmitters and receivers provide Ethernet, and Fiber-to-the-home (FTTH) transport. over single-mode fiber. 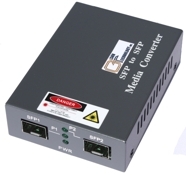 The Model OTEN-131 EtherNodePlus is a compact, cost-effective, standalone copper-to-single-mode optical fiber unmanaged media converter designed around the very latest Ethernet transceiver technology. It reliably transports full duplex 10/100 BaseT Ethernet from 0 to 40km on a single strand of fiber utilizing only one optical wavelength (1310nm). Fast Ethernet is one of the best choices for building LANs and WANs because of its high performance-to-cost ratio. However, since the copper based unshielded twister pair (i.e., CAT5 UTP) transfer distance is typically less than 100 meters, this fiber-based media converter converts 10/100 TX (RJ-45) to 100FX (SC/APC) and can extend link transfer distance to over 40km. The unit is ideally suited for direct fiber transmission of IP “Triple Play” data, voice and/or video Ethernet-based signals in FTTH, FTTP, PON, MDU, industrial, corporate, government, educational, I-Net or other applications where a high performance, compact media converter is required. It is easy to install and does not require software configuration or management, and can be deployed almost anywhere due to its small physical size. 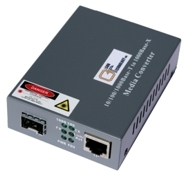 The OLSON TECHNOLOGY, INC. Model OTEN-MC-01 EtherNodePlus Media Converter, 10/100/1000Mb/s allows network operators to convert signals between an electrical Ethernet 10/100/1000Mb/s UTP interface and an optical interface. The traditional 10/100/1000Mb/s gigabit Ethernet can be extended to the distance of 70km through a fiber optic link. The OTEN-MC-01 incorporates the latest gigabit IC technology. Indicator LEDs on the front panel allow the unit’s working conditions to be fully monitored, simplifying installation and maintaining network performance. 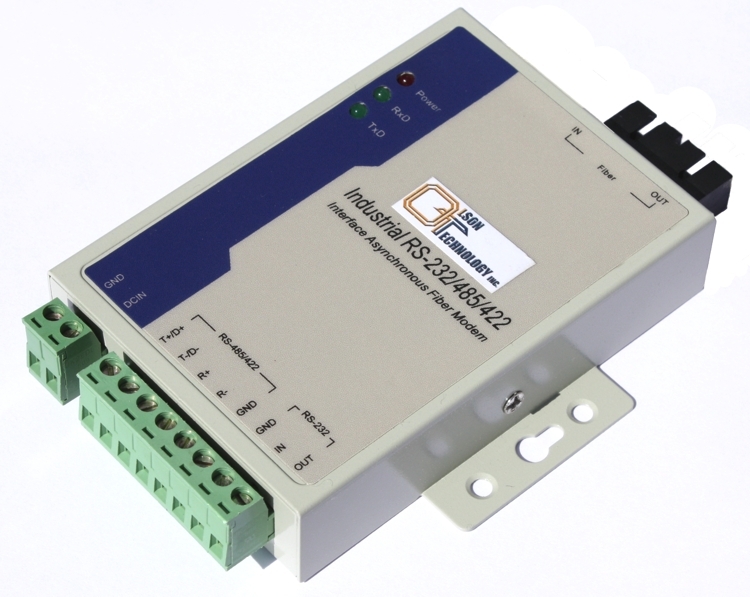 The OLSON TECHNOLOGY, INC. Model OTDL-FOM-01 RS-232/422/485 Serial Fiber Optic Modem is ideal to connect RTU to host or SCADA controllers via optical fiber. The equipment resistant to the effects of lightning strikes, power surges, and other electromagnetic interference, providing a reliable data network. The Model OTDL-DOM-01 meets EIA/RS-232, RS-422 and RS-485 transmission standards at data rates up to 500kb/s. The transmission distance is up to 20km using dual single-mode fibers. The OLSON TECHNOLOGY, INC. Model OTEN-WC-01 EtherNodePlus Media and Wavelength Converter allows network operators to incorporate multiple fiber types within a network. The converter provides the ability to accomplish this by working with existing equipment, eliminating replacement costs. The units convert between single-mode, multimode, and CWDM transmission wavelengths. This flexibility allows operators to easily extend network range to reach more remote locations. The OTEN-WC-01 includes two SFP ports. Operation is protocol independent, and the modules easily convert between dissimilar fiber modes and wavelengths. The small form factor is hot swappable. The unit offers a very compact size and multiple mounting options. The OLSON TECHNOLOGY, INC. Model OTEN-4P-01 EtherNodePlus 4-Port Media Converter supports two 10/100/1000Mb/s UTP ports and two 1000Mb/s SFP sockets to convert between 1000Base-T, 1000Base-SX, 1000Base-LX, etc. This allows network operators to convert signals between an electrical Ethernet 10/100/1000Mb/s UTP interface and an optical interface. 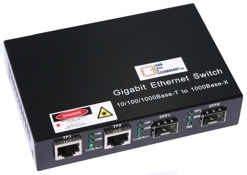 The traditional 10/100/1000Mb/s gigabit Ethernet can be extended to the distance of 80km through a fiber optic link. The OTEN-4P-01 incorporates the latest gigabit IC technology. Indicator LEDs on the front panel allow the unit’s working conditions to be fully monitored, simplifying installation and maintaining network performance.